Nearly two-thirds of people injured or killed in a crash involving a teen driver are people other than the teen behind the wheel, according to a new report released by the AAA Foundation for Traffic Safety. In 2013 alone, 371,645 people were injured and 2,927 were killed in crashes that involved a teen driver. The results come at the start of the annual “100 Deadliest Days”,, the period between Memorial Day and Labor Day when teen crash fatalities historically climb. Teen crash rates are higher than any other age group and they drive more often during summer months than at any other time of the year, according to Anita Lorz Villagrana, the Automobile Club of Southern California’s traffic safety manager. The study results should serve as a timely reminder to everyone – other drivers, pedestrians and bicyclists – to be more aware when sharing the road with novice drivers. “Families with teen drivers should continue to follow the California Graduated Driver License (GDL) law and understand the positive link between teen driver safety and everyone’s safety on the road,” said Lorz Villagrana. The AAA foundation performed the study to raise awareness among parents of teen drivers and all road users. particularly during the “100 Deadliest Days” period. Based on the AAA analysis of the government’s Fatality Analysis Reporting System (FARS), in 2013, an average of 220 teen drivers and passengers died in traffic crashes during each of the summer months, a 43 percent increase compared to the rest of the year. AAA has been a decades-long advocate on behalf of teen drivers and their families and has been a leader at the state level in advocating for the implementation and improvement of GDL laws and quality driver education programs. Additional data from this study point to the drop in overall crash rates for teen drivers that can be attributed to strong GDL legislation as well as other factors including falling gas prices and the economy. “Great strides have been made to improve the safety of teen drivers over the past 20 years, but motor vehicle crashes still remain the leading cause of death for drivers aged 15-19, so advocating on behalf of teen driver safety remains a top priority for AAA,” said Lorz Villagrana. 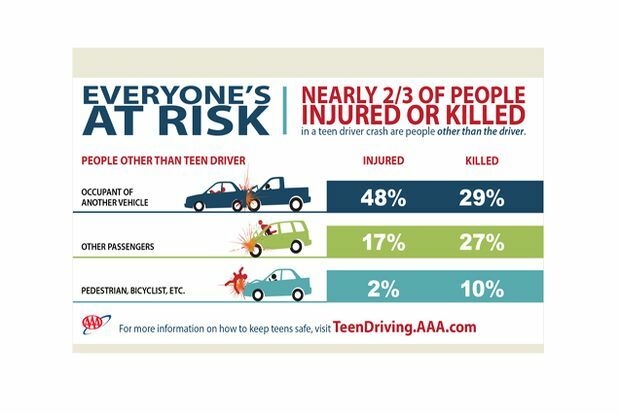 On AAA’s award-winning web site TeenDriving.AAA.com, tools are available to help parents prepare for the “100 Deadliest Days” of summer driving, as well as other resources to coach teens through the learning-to- drive process such as a parent-teen driving agreement. Parents have found the online AAA StartSmart program on the site to be particularly useful, helping them to quickly become effective in-car coaches, make informed decisions about access to a vehicle, and manage their teen’s overall driving privileges. Established by AAA in 1947, the AAA Foundation for Traffic Safety is a 501(c) (3) not-for-profit, publicly-supported charitable educational and research organization. Dedicated to saving lives and reducing injuries on our roads, the Foundation’s mission is to prevent crashes and save lives through research and education about traffic safety. The Foundation has funded over 200 research projects designed to discover the causes of traffic crashes, prevent them and minimize injuries when they do occur. Visit www.AAAFoundation.org for more information on this and other research.